This is a great way for a social catch-up that is becoming more and more popular. Bring your family, friends, and pets even if they aren't diving ;-). We usually have 1 or 2 gazebos set up to provide some shade and to cook the BBQ whilst everyone is on their dive. 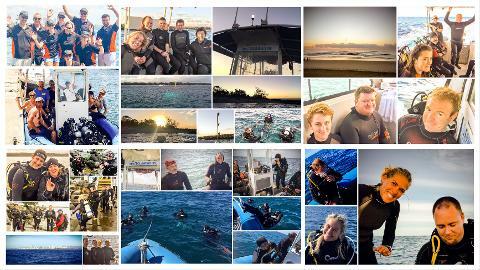 We have tanks and other scuba equipment for hire available which can be added to your booking on the next page once you commence the booking process. If you have all your own gear please join us nevertheless. Everyone is welcome :-). A further benefit is that you will receive all the event details via email including reminders to ensure you don't miss it. This is a shore dive from the spit via the diver access stairs. It is easy to navigate since you are following two submarine pipelines, usually surrounded by loads of fish. 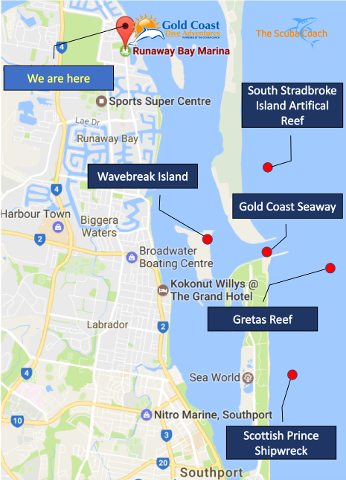 Other options for this site include diving to the east and west along the Southern Rock Wall or to do a drift dive from the diver access stairs heading west along the Southern Rock Wall. 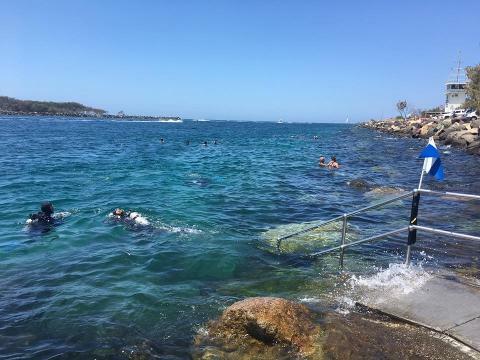 Provided you enter the water at least 15-30min before high tide, the turning tide will then bring you back to where you started the dive. Should you wish to drift all the way around to the South-West Wall and exit at the Spit Finger Beach, you should enter the water about 50min before high tide. The depth is only between 4m and 14m depending which dive path you choose. As mentioned earlier, this site is tidal and it is therefore important to be on time. If you miss the tide, you miss the dive :-). Not a problem at all. This is a social event and their will be others that need someone to buddy up with as well. We'll help with the introductions! 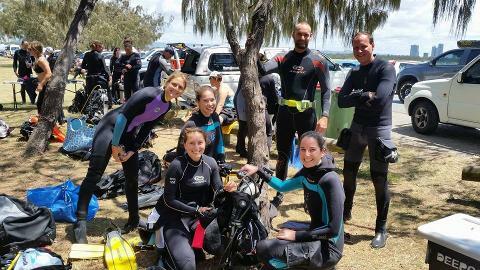 The Scuba Coach will have at least two PADI Instructors and Divemasters at the site and we are happy to give anyone a hand who hasn’t been diving for a while. This service is complimentary but please be aware that this is not a guided dive. If you haven't been diving in a while please use the contact function on this page to have a chat with us beforehand. We will be able to give you advice whether this dive is suitable for you or not. This is a social dive and you are responsible for your own safety and in particular for diving with a buddy. Our in-water dive guides are complimentary. For your convenience and piece of mind, surface support is provided in form of dive site briefings (if requested), dive flag, first aid supplies, emergency oxygen and a qualified rescue diver. 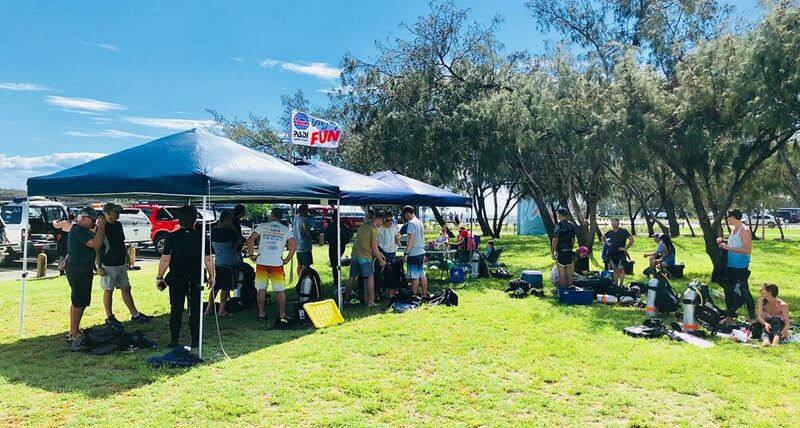 If you are hiring a tank or other equipment, we are required to sight your diver certification card as it is an offence in Queensland to hire out scuba equipment to non-certified divers. The BBQ is FREE, however a gold coin donation can be made to cover LPG gas and disposable cooking utensils etc. As mentioned earlier, it would help us buying the right amount of food if you register yourself even if you do not require any hire equipment. We usually have a gazebo setup with a diving and/or PADI flag. There should also be a ute parked up with The Scuba Coach written all over it. We usually only charge your credit card the day before the dive once we know that conditions are suitable.